For Sale Truly outstanding 148cm 2002 gelding by Leuns Veld's Lord+Zeldenrust's Neptun. For Sale Spectacular 2004 Del Gado+ Gervatus gelding. 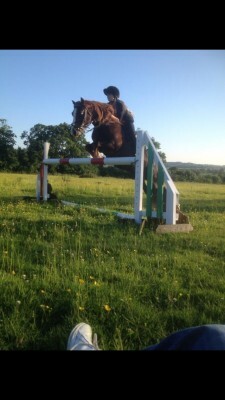 13hh, 14y/o Welsh Mountain Pony for sale, due to being outgrown. This little superstar has now brought on 2 riders who both adore him, has recently qualified for Midlands SJ and has won 11 of his last SJ shows. Is very kind and he’ll jump out of his skin for you, however he is not a novice ride, can be strong and will test new rider. Has a huge jump for his size. Despite loving his SJ, he’ll happily do bits of everything however is very very strong out hunting, so jockey would have to be confident and brave - heartbreaking sale due to his being outgrown by two riders now, and is wasted not regularly being in work. His welfare is paramount, and 10* loving and knowledgeable home essential. Hacks out alone or in company, good to catch, box and shoe. Would suit confident, brave young jockey, who wishes to progress with their riding and have a lot of fun on a very special pony, who is very loved, and has bags of character. Has done PC, SJ, XC, ODEs, hunting and local shows, is quick on the ground, and very good at gymkhana.